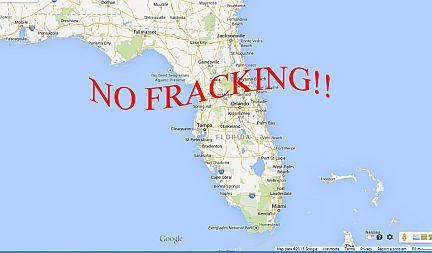 Sierra Club Florida News: Fracking Bill Vote in Senate Appropriations on Feb 18??? Fracking Bill Vote in Senate Appropriations on Feb 18??? The fracking bill has slowed down a bit in the Senate thanks to your calls, emails and personal contacts with our State Senators. The bills, backed by the oil and gas industry, not only enable the dangerous drilling practice in places like the Everglades, but they would force local communities to accept it. HB191 by Rep. Rodrigues passed the full House of Representatives on January 27 by a vote 73-45. There is still time to stop the bill in the Senate. The next opportunity for the Senate Appropriation Committee to hear SB 318 (companion to HB 191) would be on February 18, If the bill passes in that committee, it will be considered by the full Senate shortly thereafter. Please call your State Senator between now and February 18 -- especially if your Senator is one of the 19 members of the Senate Appropriations Committee. 1. Find your State Senator by clicking here. 3. Send this to your friends. Thank you for all you do to protect Florida's environment. Read more: What is Fracking and what is wrong with SB 318? The narrow definition of fracking in SB 318 excludes the acid-matrix stimulation technique most likely to be used in Florida. That means none of the permitting, or the study, or the rules will affect acidizations in the least - even though the same toxic cocktail will be injected into the ground. The bill preempts counties and cities from regulating or banning fracking. It deprives citizens of their ability to protect themselves from contaminated water supply and its health impacts. The trade secrets provision means families won't even be able to find out what chemicals are being used. PS: Be sure to take action and share this on Facebook and Twitter! To learn more about the work of the Sierra Club Florida, visit our website and our Facebook page.